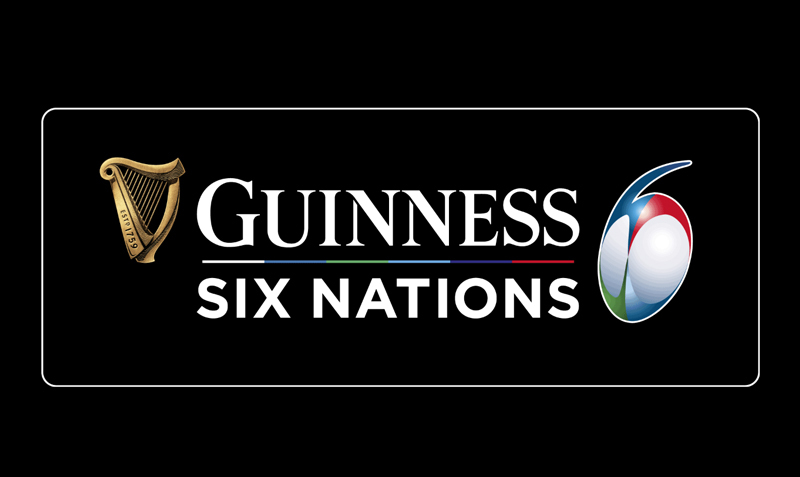 Rugby fans all over the country rejoice… The Six Nations is almost upon us! 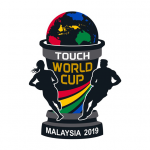 Every year that holds a World Cup is a year to look forward to for Rugby fans and 2019’s World Cup competition, taking place in Japan, is arguably the most open and highly anticipated in the history of the sport. However, before the World Cup commences, we are lucky enough to have our Rugby appetites wetted with the Northern Hemisphere’s magnum opus, the Six Nations. 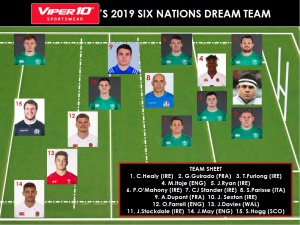 With this at the forefront of our minds, Viper 10 has put together our Six Nations dream team. We have no doubt you won’t agree with all our selections but that’s part of the fun and we look forward to hearing what you think! So, without further a do, let’s get started….. The two-time player of the tournament (2016 & 2017) is a true world-class talent and has been an integral part of Scotland’s rise to prominence in recent years. Easy selection for the 15 shirt. May has flourished under Eddie Jones’s regime and now finds himself as England’s first choice winger despite some fierce competition. When May debuted for England, it was safe to say that he was a little ‘green’ but the electric finisher has improved his game drastically in recent years and is now a complete winger who adds an exciting dynamic to the England back-line. Davies has faced some frustrating injuries over the past few years but when healthy, the Welshman is arguably the best 13 in the World and Wales will be hoping that he can rediscover the form that earned him the honour of being named Player of the Tour on the Lions historical 2017 Tour of New Zealand. As one of the world’s best and England’s unquestionable driving force, Farrell simply has to feature in this team. His attitude, poise and control coupled with his ability and rugby IQ separates him from others, with Farrell arguably influencing his side’s performances more than any other player in World Rugby. Last year’s Player of the Tournament, Stockdale has made his mark on the international and domestic stages over the past 24 months with some sensational performances. An ultimate finisher, the Ulster man has an ability to score tries that are almost inconceivable. World Player of the Year 2018 is an incredible accolade but Sexton would undoubtedly trade that in for another Six Nations grand slam and a World Cup winners medal. Sexton is a joy to watch and can pull the strings like no other 10 in the world, helping to establish Ireland as the dangerous side that they are. Dupont is the latest in a long line of fantastic French scrum halves. The young man has been in superb form for Toulouse and gets the nod over Connor Murray who has only recently returned to action. It’s fair to argue that Dupont is destined to be more influential for his country than any other scrum half in the competition. It would be a travesty if the diminutive halfback didn’t start in France’s opening fixture but it wouldn’t be the strangest thing we’ve seen from the French selectors. There is a handful of top class number eights in the northern hemisphere but as long as he is on the field, Parisse is king. The Italian talisman has consistently been one of the best players on the planet and with this year possibly being his last Six Nations, the legend will be looking to do all he can to avoid Italy receiving the wooden spoon. 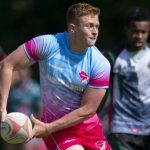 Even with Scotland’s Hamish Watson and a host of other quality 7s missing the tournament through injury, this was an extremely tough decision. Wales have a plethora of very capable options at openside but we had to go with the ever-reliable CJ Stander. Another Irishman who had a fine 2018, Stander has proven himself on the biggest stages and his tireless work rate and tenacity is a not taken for granted by the emerald nation. 2018 was an incredible year for the Ireland captain but 2019 could be even better. O’Mahony is finally being recognised for his intelligence as well as his unwavering determination and leadership. It is hard to explain to non-rugby fans what makes the Munster man so special but he truly is a modern legend of the game. Like numerous players on this list, Ryan has seen an incredible rise to fame since bursting on the scene as a ‘youngster to watch’. The 22 year-old began his professional career as ‘Mr Unbeatable’, winning 24 consecutive matches and has become one of the first names on Joe Schmidt’s team sheet despite fierce competition at his position. Similarly to Ryan, Itoje burst on to the scene with an impressive unbeaten streak that stretched an incredible 31 matches for both club and country. On his day, Itoje can be a nightmare to play against and England will need him to have a huge Six Nations if they are to challenge for the championship. This dude is a beast. Unquestionably one of the best players on the planet, it is very likely that Furlong will go down as one of the greatest ever when his career draws to a close. This was the easiest selection by some distance for the Viper 10 team. The French captain has been a constant for the traditionally unpredictable nation, carrying the side almost by himself at times with unrelenting performances. He is a tireless worker with a unique skillset that shines through whenever he’s on the field. Not so long ago, Healy looked to have lost his spot in the Ireland starting line-up but after a resurgence and spate of thunderous performances he cemented himself as not only the best loosehead in his country but as one of the best in the world once again.